The ancient Siddha Tradition, a tradition presumed to be lost is now finding its way back into the hearts and lives of people worldwide. Siddhas, Masters of the Basics expresses the enriching flavour of the Immortal Masters, their teachings, its esoteric nature and divine prowess to be alive even today. The author offers easy understanding of this ancient spiritual science through his personal experiences with hidden Masters of this vast tradition and their teachings. He narrates relevant anecdotes that help the reader unravel the otherwise cryptic quality so typical to this cult. Ancient wisdom in its nativity remains undisturbed and teachings imparted by sages in primordial times retain sharp applicability even in our post modern world. The Book begins with an introduction to the historical lineage of the Tradition travelling back to Lord Siva, followed by the delightful, inspiring life incidents and accomplishments of twenty-one prominent Ancient Siddha Masters. The next chapter, ‘Creation’, is on the Cosmology of the Siddhas, which leads the reader into areas related to human existence and then 'beyond'. From here it turns into a personal journey into ones inner cosmology. Beginning at the point of conception, the author explains principles contributing to the birth of an individual, which continue to influence and govern through our entire lifetime. Based on this he branches into the imperatives of life - food, lifestyle, health and ill health. After tackling the situational and causative possibilities affecting life-imperatives, the book speaks of Healing remedies. At every point the author reminds, the body-mind-spirit to be inseparable and to be always taken into consideration as a whole as their interconnectedness is a pre-established Cosmic design of Existence. Due weight is given for this very basic and wholistic understanding to take firm ground in the reader. The voyage into the Yogic dimension of the Siddhas begins by exploring present-day obstacles that first need sublimation before a practitioner can enjoy the native prowess of deeper transformation prophesized by the Siddhas as the Yoga of Life. There is an exclusive on the aspects of the Kundalini Sakthi, its nature and the disorders arising from improper practices commonly undertaken today. Alchemy is another salient dimension of the Siddha system. This chapter includes both, External Alchemy as well as the inner alchemical landscape of an individual. The reader is then led into the world of ancient idols and deities to learn their esoteric significances. This unravels messages told by the Ancients through the way of Worship. Four such idols have been appraised. The Tantric section, painted in the reverential colour of conventional Siddha Tantra, speaks of the essence of genuine Tantra. Before which, misconceptions resulting in the misled present day attitudes of new-age practitioners has been spelt out and clarified. The chapter covers different Upasana's revealed by the ancient Siddhas supported with explanations of the inner significances of each. Propped up by personal experiences and divine encounters the next chapter praises the varying colours of the Divine and the qualities IT expresses. And finally, as seen in metamorphosis, the last section abridges all the qualities extolled by the ancient Sages throughout the journey of the book. The final sections conjoins the Siddha typicality of each Section and brings it to life once again but with an active relevance that allows one to relate, standing in ones own life situation. Here the reader can indulge in the spirit of the Siddhas and its colourful expressions as the author describes the different light radiating facets of an Immortal Master - a Siddha. Another salient dimension, portrayed in its truest colour is the ancient Martial Art system. The author has devoted a separate chapter to the most feared disease of today's world - AIDS. He elucidates on the roots and cures of this disease as spoken by the ancient Healers in their manuscripts. The authenticity of this book is heightened by the inclusion of the ancient cryptic poems (translated into English). The twilight language used by the ancient Sages in their compositions and verses is far from easy understanding and needs proper deciphering before one can extract the sap of hidden messages. The author includes poems at relevant points throughout the course of the book as supportive evidence. The sacred verses are extremely powerful illustrators for the reader to truly revel in the spirit of the Ancestors. All in all, Siddhas - Masters of the Basics comes as an inspiring preamble, walking an existential pace through more than 600 pages; an open invitation to to the world of the Siddhas. A unique and rare encounter; a complete detailed synopsis of the immense, vast, incomprehensible quintessence of the Ancient Siddha Tradition! 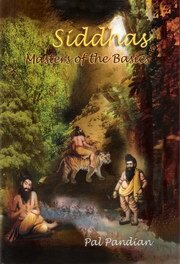 Pal Pandian, the author of ealier articles on Siddha Tradition published in different magazines, has recently released his much awaited book SIDDHAS - MASTERS OF THE BASICS - unique and rare encounter; a complete detailed synopsis of the immensely ast and incomprehensible quintessence of the Ancient Siddha Tradition. By relinquishing his formal education, Palji walked away from a promising career in engineering to answer the Call of the Siddhas. He lived as a wandering ascetic for 2 years meeting and encountering many hidden Masters. His search for various hidden Masters bore fruit in surprising ways. He was nurtured, nourished and groomed for his Life's Work which even now continues to unfold. After 12 years spent under the immediate guidance of different Siddha Masters Palji offered his life to the preservation and revitalization of this almost forgotten Ancient Siddha Tradition. He spent 3 years in Madurai serving, guiding and freely offering his services for the benefit of humanity. His close association with the Tradition and its Masters also led him to work as a Native Healer for the past decade. Through Siddhas - Masters of the Basics Palji speaks of special events, encounters, experiences, oral teachings and valued insights received while in the vicinity of his Masters. His dedication and sincerity towards Life itself acted as the platform for the benedictions to be showered. This is not a book. It's more like a symphony created by the Siddha Maestro Mr. Pal Pandian. It has been music to my ears ever since it found me! It has grown on me. It has helped me understand the depths and the many layers of spirituality, concepts and the divinity of Siddha System. I hope this book brings joy and love to spiritual aspirants. Having read all the Aghora books, this book by Mr. Pal simply is in the league of extra ordinary books available in the market. Hats off to Mr. Pal Pandian. I hope spiritual seekers, teachers and even first timers embrace this book with not just an open mind, but a open heart. The author has taken great pain to give us such a DIVINE gain. "Ahimsa (non-violence) means not causing harm to anyone, but it is not merely refraining from inflicting injuries on others with one’s limbs or weapons. Non-violence also has to be practiced with purity of mind, tongue and body. There should be no ill-feelings, for that too is a form of violence. To cause bodily harm to another is violence, but so is speaking harshly. Your speech should be sweet, pleasing and wholesome. All your actions should be helpful to others". This is not a book. It's more like a symphony created by the ..